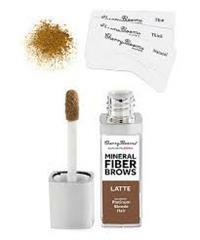 The Cherry Blooms Mineral Fiber Brow Kit takes the guess work out of brow shaping! 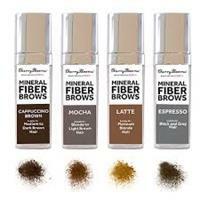 Their proprietary blend of natural fibers, clay and mineral powder act like instant brows, embedding fibers that fill out gaps and extend length where needed. You do NOT have to have eyebrow hairs for Fiber Brow to work. The semi-permanent formula stays on the surface of the skin and does not absorb in pores making it sweat and splash proof. Cherry Blooms designed a Fiber Brow Kit with three different stencils in four different shades. The result is professional looking brows in 10 seconds that is easy to apply and stays on throughout the day and night. The stencil takes the guesswork and out of complicated brow shaping. The kit can last anywhere between 6 and 12 months depending on how often you use it. It is a semi-permanent formula which won't fade during the day. It's sweat and splash proof. Because our product works! Our formula contains natural high grade potent beeswax and BLACK fibres which deliver dramatically longer and thicker lashes. Our product does not smudge or run and it stays put all day long. The fibres do not fall on your face unlike other brands; and it looks freshly applied even at the end of a long day.